This is Part 3 of a series on building a fire pit. If you haven't seen them already, return to Part 1 or Part 2. Safety Note: Check with your local safety codes before building any fire pit. Some zoning areas will require safety and building inspection for any new structures, particularly a fire pit! Be sure to build your fire pit away from low hanging branches and at least 20 feet away from any flammable materials or structures. Using a mesh screen lid when you build a fire is the safest means of preventing burning embers from causing a problem. 1. As you continue building a fire pit wall, measure the height periodically. Stop when you are getting close to your desired height and test with capstones (the flat stones which will make the top of your outdoor stone fire pit). When you have reached the desired height with the capstones, you are ready to start setting the capstones. 2. You should plan on having two rows of capstones in one layer. The outer row will cover the face stones you have build up in the wall. The inner row will cover the fire brick so that the fire brick is not visible from the top. 3. I suggest setting the capstones in place without mortar first to make sure the whole puzzle fits! Try to keep the space between stones consistent and use your level frequently to insure they are level all the way around. Once your first capstone is leveled and set in mortar, use that as a reference to level all the others to. You can use a large (4 foot) level to do this to be sure the whole top is flat and level. 4. Before securing the capstones with mortar, be sure the space between the fire bricks and face wall are totally filled with loose stone and mortar so there are no gaps to weaken the structure of the stone fire pit. This also helps you get rid of all the extra smaller stones and stone pieces that are laying around! 5. Set the capstones with mortar and be sure they are level. Smooth the mortar between stones with a jointer and brush to remove excess mortar so it is clean, even and flat. 1. After building a fire pit, an optional seating area can be created around your fire pit as well. This can also be added at any time after you build a stone fire pit. 2. Use the string and spray paint trick (see Part 2) to mark out a circle around your stone fire pit which will be the seating area around it. With shovels, dig out this area to a depth of about 2 - 3 inches for a crushed stone or gravel seating area, or to 4 - 5 inches (the thickness of a piece of brick or tile) for a brick seating area. 3. The simplest way to make a seating area when building a fire pit is then to layer the area with landscape mesh (cut with a utility knife; this prevents weeds from growing up). Secure and cover the mesh with crushed stone or gravel (this can also be bought at a quarry or stone yard or home supply warehouse). Spread the crushed stone evenly with an iron rake or other tool. 4. If you decide on a stone or brick seating area, simply pave with mortar and bricks to fill in the area. For greatest strength and stability, dig it out even deeper and make a 2 - 3 inch thick concrete base or foundation with rebar pushed into it as above. Then build a layer of brick, stone or tile with mortar on top in one layer. Remember to use your large level to insure your seating area is flat and even! 1. After building a fire pit, I recommend spraying the fire brick with black stove paint so that it is not obvious and blends in. This takes the focus of the bricks and puts it where it belongs, on your beautiful stone work and the raging pit fire you build! Be sure to use a piece of cardboard or masking take to block your capstones when painting so that they do not get painted too! 2. You can place some river rock or other large stones in the base of your outdoor stone fire pit to both raise the height of the fire (if necessary) and to help with drainage. It also adds some pretty contrast with the outside stonework of the stone fire pit. 3. As a final step after building a fire pit, rinse or wash your stone with water and a brush or towel to remove dust and dirt that has accumulated. Your outdoor stone fire pit is done and ready to use! Building a fire pit is pretty easy, isn't it!? Now its time to test it out with your favorite fire wood. If you want to use your outdoor stone fire pit as a barbecue pit, simply start a fire and get good hot embers going. Then lay a grill grate over your pit and cook your favorite grilled recipes on it! You can even rig up a rotisserie over your fire pit to roast larger meats like whole chickens, suckling pig, lamb or duck. If you don't want to get that fancy, simply get yourself some long skewers and you can make hot dogs, sausages or s'mores by hand! Go back to Part 1 or go back to Part 2.
and want ideas for other fire pit plans? 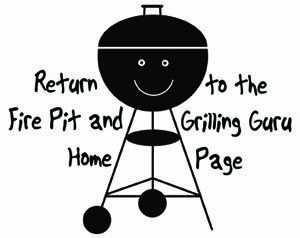 Return to the Build a Fire Pit page.